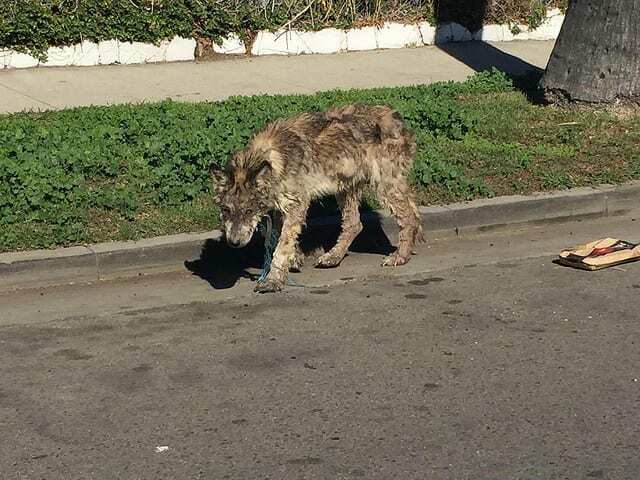 The well-known rescue group, Hope for Paws, recently received a text about a ‘wolf’ roaming around the streets of Los Angeles. 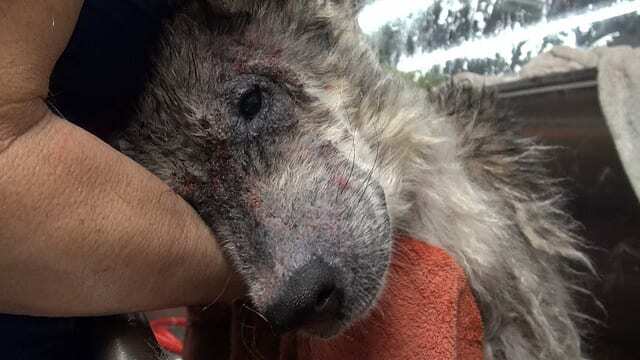 Shocked to hear such a thing, Hope for Paws rescuers rushed to the scene to help this supposed wolf that was clearly lost and out of its element. 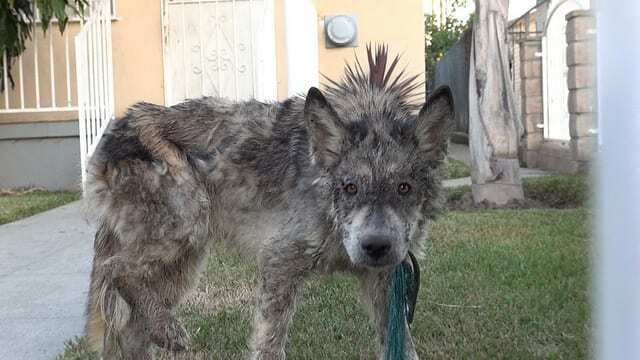 When they arrived – the found the ‘wolf’ inside a gated yard. 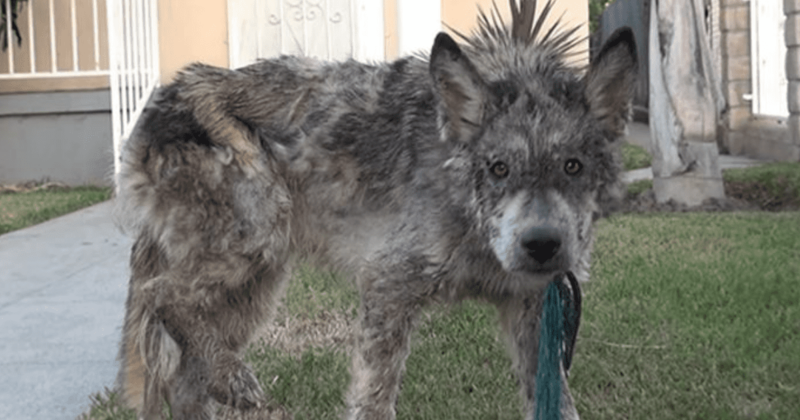 The poor canine was disheveled, malnourished, and in desperate need of medical attention due to pus seeping out of multiple sores and wounds on its body. 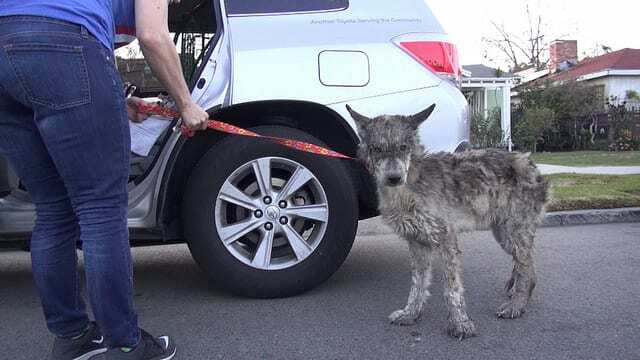 One of the rescuers on scene, Lisa Chiarelli, saw the ‘wolf’ with unkempt fur and immediately closed the gate behind her – not wanting it to escape. It wasn’t long, however, that they noticed that this supposed wolf’s demeanor did not match up with what a wolf would normally act like. In fact, they found that this particular canine was quite sweet, gentle, and far from threatening. Hope for Paws thought that this dog could potentially be a wolf-hybrid of some sort. 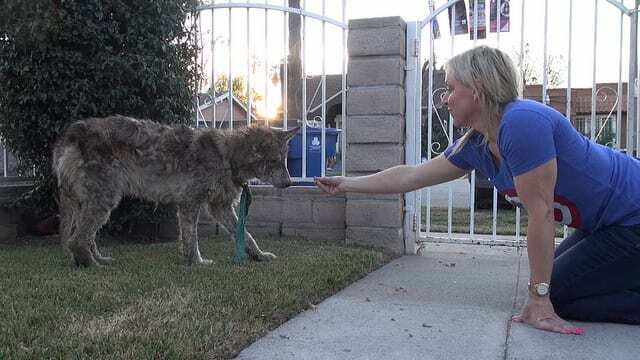 After feeling more comfortable around the stray dog, the rescuers tried to offer her some food. The sweet dog, which is now named Julia, graciously and gently accepted their offer. That’s when they noticed something around her neck. “Julia had an old rope tied to her which indicates to me that someone owned and neglected her to a criminal level…,” Eldad Hagar, Hope for Paws founder, wrote on Flickr. Once she got close enough, Chiarelli was able to slip a leash around the dog’s neck. The rescuers started to walk Julia toward their vehicle and it became clear that the stray dog was in a lot of pain. She walked with a severe limp as she approached the car. Video of the entire rescue can be found below. They rushed her to the vet clinic for immediate medical evaluation where they found a plethora of issues that were plaguing the poor girl. Julia was suffering from mange, malnutrition, and multiple bacterial infections. “Julia’s paws were so swollen, her nails were so long…” wrote Hagar. They treated her with medication and special baths to help relieve some of her pain and symptoms. “When we got the water running, we noticed right away how skinny she was,” Hagar explained further. When the water hit Julia’s skin, she began to bleed because of all the scabs that started to fall off of her. During the entire process, the sweet girl stayed calm and simply rested her head on Chiarelli’s arm. She knew they were there to help her. After a bath and a bit of grooming – the ‘wolf’ was beginning to look more and more like a dog. She was finally able to get a bit of rest in a safe place, and after some much-needed love and care – Julia started to gain her energy back. It wasn’t long before the rescuers saw Julia’s tail wagging for the first time since they rescued her. Day after day, Julia began to make improvement after improvement. 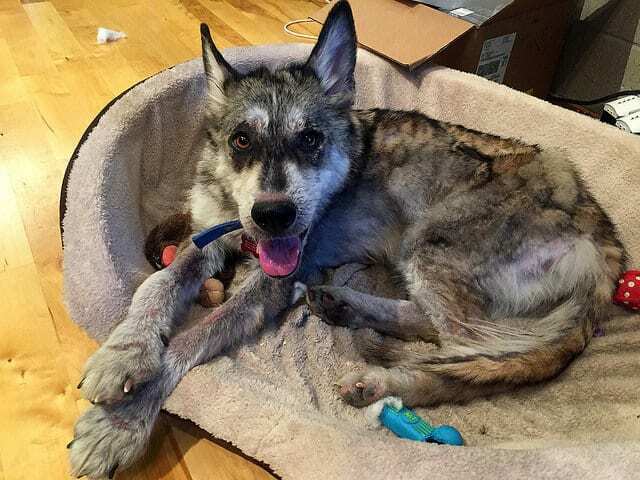 She was a far cry from the ‘wolf’ they had found in the yard of that L.A. home and soon, she was placed in a foster home where she had two other doggies to play with. Curious to know what Julia’s breed mixture really was, Hope for Paws performed a DNA test on her – it turns out, she wasn’t a wolf at all! The DNA test revealed that she was actually a 2-year-old German Shepherd and Siberian Husky mix! Her personality is so kind and loving that a family, the Snooks, were eager to adopt her. All thanks to the help of Hope for Paws and the Art N’ Paws rescue organization/shelter. 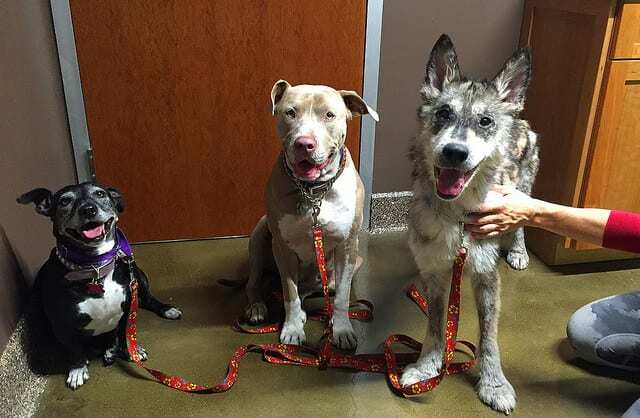 The loving girl, who is certainly not a wolf, now has a family that will take care of her and love her for the rest of her life. Watch video footage of the entire rescue in the video below.